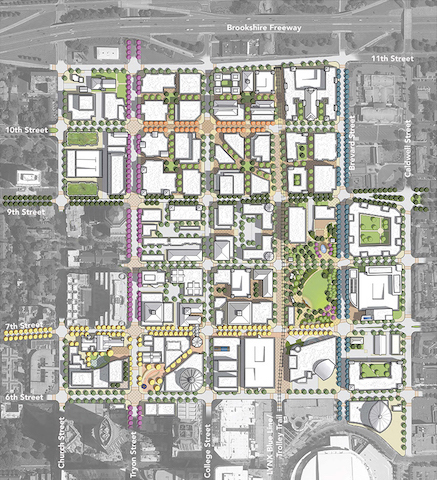 A public planning initiative to develop and establish a vision to catalyze and sustain growth and development in the North Tryon area of Uptown Charlotte. The largest remaining development opportunity in Uptown Charlotte, the 60-acre, 50-square-block North Tryon area, has existing strengths and character to protect and grow, as new development opportunities foster economic vitality for the overall Charlotte area. Partnering public, private, educational and non-profit organizations sponsored development of the North Tryon Vision Plan, drawing on the expertise of urban design, architectural consultants and local stakeholders. To inform the plan, the project team gathered extensive input from area property owners and developers, business leaders, residents, community advocates and faith-based leaders through a series of stakeholder interviews, events, tours, symposiums, workshops and feedback sessions. The vision for North Tryon emphasizes catalyzing projects that enhance the area’s strengths in culture and learning that help define its character – and present new opportunities to provide a range of housing, services and businesses that expand economic opportunity in the community. The following projects are underway in North Tryon. Additional project overviews will be added over the life cycle of the North Tryon Vision Plan. Please click on on the projects to learn more.